Not Just a Dance! | I am JuJu! Chris: Hey buddy! Did Skylar mention anything to you about going to a dance next weekend? Me: She sure didn’t. What did she say? Chris: Well, she told me that she told a boy in her class that he should take her & that he said he would love to! Me: Really? That is so like Skylar to just tell someone what she wants done! When I got home from Phoenix on Sunday, I asked Skylar about it and she just stated very matter of fact “Mom, I told John he should take me to the dance and he is thrilled to!” I laughed and told her that we should talk a bit more about it later and she said that would be fine. You see, we’ve been down this road before. Skylar mentions that she wants to go to the dance and either the boy’s parents won’t let him go, or she changes her mind. I definitely did not get over excited or worried about anything as Wednesday came around and nothing else had been mentioned about the upcoming Friday night dance. Thursday morning while we were getting ready for school Skylar said “Mom, don’t forget about the dance on Friday. John said he’d meet me there. Oh yeah, I also need a dress.” At this point, my pulse definitely started racing as I had thoughts swirling around in my head. Immediately I thought about whether this boy would show up and how she might react if he didn’t. Would I be able to console her? Would she have an absolute melt-down on the spot in front of a bunch of middle schoolers? I also did NOT feel comfortable dropping her off and leaving her in an entirely new and different situation than she had ever experienced. I regained my composure and said “Skylar, I’m not comfortable just leaving you at the dance. Also, it’s Thursday and I’m just wondering if John is actually going to be able to go.” She assured me that he was definitely going and then she said “Mom, you should just come to the dance too! Won’t that be fun?” My heart instantly melted as I was reminded how much I love the fact that she isn’t embarrassed to have me around. I love that her first thought was that I should just come with her and chaperone. I love that she comes running down the hill after school each day waving at me and screaming “HI MOM!” at the top of her lungs. I assured Skylar that I would check into chaperoning that day. Later that day I walked into the office to drop off some behavioral assessments for the district psychologist who is doing Skylar’s mandatory 3 year re-evaluation. As I dropped the papers off I mentioned to the school secretary that Skylar wanted to go to the dance but that I was super nervous about her staying without either Chris or me. She immediately said that she would talk to the principal (Mrs. H) and ask her about chaperoning. A few minutes later she emerged from the her office and said that Mrs. H would be delighted to have me help chaperone and that I was welcome to come to any dance. The secretary told me to make sure that I brought Skylar’s ticket as they would not be selling them at the door. I said that I’d better buy her one as I was sure that she didn’t have one since she had not asked me for money that week. Mrs. H overheard me asking to buy a ticket and peeked her head out the door to let me know that Skylar already had a ticket. She said “Today at lunch when we set up our ticket table, John came bounding across the lunchroom saying that he was buying 2 tickets, one for him and one for Skylar. He couldn’t get to the table fast enough!”. This was about one of the sweetest things I had ever heard. I left the office feeling cautiously optimistic that this would be a great experience. As I waited for Skylar to come down the hill after school I called Chris to tell him that any evening plans would have to be postponed as we had dress shopping to do. I then saw Skylar running down the hill waving a yellow paper in hand with John following not far behind her. John wanted to make sure I knew that the yellow form was Skylar’s ticket and permission slip and not to forget to sign it. I assured him that I’d sign it and that we were going to get Skylar a new dress. As I got into my van, I could still see the huge smile on John’s face from across the parking lot. I’m pretty sure everyone else could see mine too! Living in a small community like Prescott, I didn’t have a whole lot of options for dress shopping, so off to Kohl’s we went. Skylar does NOT like to shop or try clothes on so I explained to her that she was going to have to try on a few dresses but that we would only pick out the few that she was most interested in. I promised her that we would be as fast as possible. She chose 2 dresses to try on and the first dress was very shiny but had lots of netting on it. It kind of looked like a mermaid dress. As soon as it went over her head she immediately starting screaming “Scratchy! Scratchy! 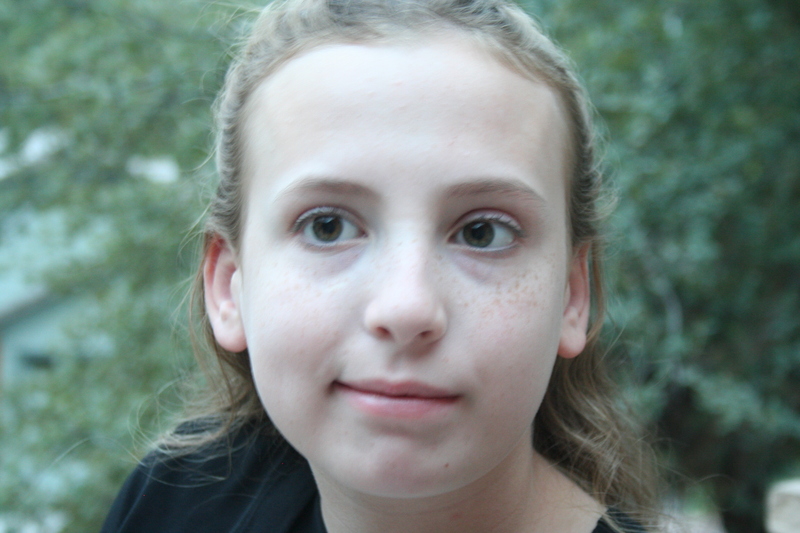 Scratchy!” Skylar has lots of sensory issues which is very common with children on the autism spectrum. I got that dress off of her as fast as I could praying that the other dress would not be scratchy. As she pulled the next dress over she said “Oooooh! This one’s nice and smooth! I like this one. 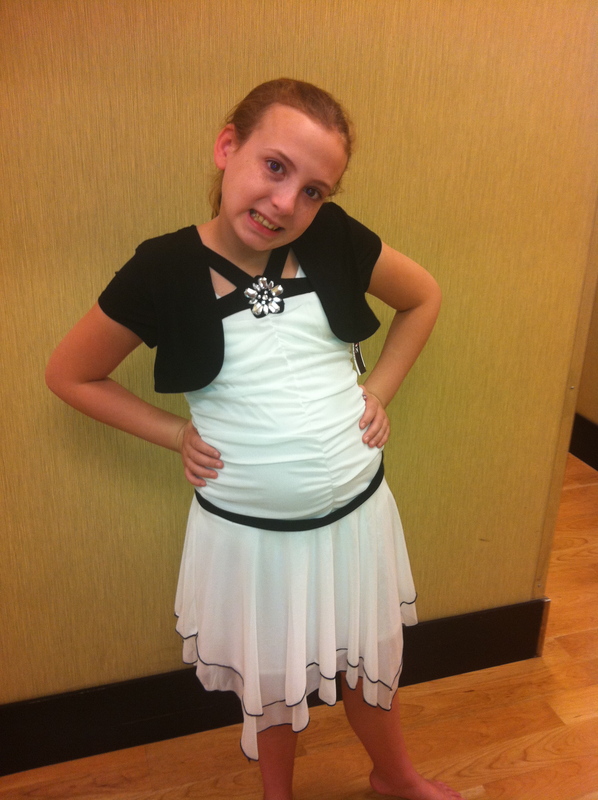 This is it!” Most parents would probably encourage their child to try on a few more dresses but knowing Skylar’s issues with fabric and really not liking to try on clothing, I knew that ending now would ensure a successful shopping trip! We also picked up a cute pair of beaded black sandals to finish off the outfit. For those of us with children with special needs, it is essential to know their limits. Two more minutes of trying on “scratchy” dresses could’ve ruined this near-magical time with my Skylar. As I was checking out, the friendly cashier asked Skylar what the fancy dress and shoes were for. Skylar simply replied, “A dance”. As Skylar walked off to scout out the stuffed animals the cashier said, “That’s quite a bit of money for a middle school dance. She is very lucky”. I got a little teary eyed at this point (I was actually amazed that the tears stayed at bay this long) and said “Well you see, this is not just a dance. This is so much more than a dance to me! I’m so thankful to be buying this dress and these shoes right now!” I decided to share with her a little about Skylar and why this dance was so special. Within moments she was teary eyed too. Thankfully it was late in the evening and there was nobody in line behind me. The cashier was so lovely and she thanked me for sharing a bit of Skylar’s story with her. As we left the store, she yelled out “Skylar, have a great time at your dance!” Skylar looked back, gave her a smile and a thumbs-up, and walked out the door. Most people would look at this picture and just see a dress and some shoes. I see so much more than that! I see hope. I see excitement. I see an opportunity for my sweet girl to do something that most typical kids get to do all the time. I want to remember this feeling for the rest of my life! I truly hope that I get to experience it again, but if I don’t, I’m so thrilled to have had THIS experience. After Skylar went to bed, I thanked God again for this sweet moment with my daughter! I will cherish it forever! Part 2 of Not Just a Dance (Our experiences at the dance) will be posted tomorrow! Click HERE to read Part 2! Sweet! I’m enjoying your blog Julie! Can’t wait to hear about the dance! Thank you Angela! I am really enjoying sharing our story. So glad you are following along. Thank you so much Leah! We have had so many joyous moments & I never want to forget how blessed we are to have both of our girls. I’ve enjoyed following along with your move to Denver. Keep writing! Thank you Aunt Betty! We are blessed to be her parents and truly love sharing her story with everyone. I’m excited to share about all the happenings at the dance. It was a fabulous time! I am teary eyed reading this. You’re right that it’s not just a dance – it’s so so much more 🙂 I felt the same way when my boys first went into the water (it’s not just wading) or any of the other things that others might think is mundane. And how lucky are you! You’ll be able to see it all happen in front of your eyes at the dance. It’ll be a magical night for all of you. Thanks Angel! You know all too well! It’s so important to see each and every thing for the wonderful moment it is, whether it be a dance, going into the water for the 1st time, or reaching a new milestone. Thanks for reading about our journey. I look forward to hearing about yours as well! Skylar would have been overjoyed to have her Aunt Diane there! She loved dancing at your wedding. My favorite was looking over and seeing her dance with a little boy that was 2 feet shorter and about 7 years younger. Too cute!